The skin is the human body’s largest organ, and taking care of it is very important to your health. It is our external barrier, and its essential function is to protect the body from the environment. It is considered a single organ, because it functions systematically. It is very large, with a surface area of approximately 2 m2 and it weighs 4 kg, accounting for about 16 % of your total body weight. The skin is constantly replenishing itself and changing. What is the function of skin? The skin acts like a protective shell against mechanical, chemical, toxic damage and pathogenic micro-organisms. It also contains melanocytes and other structures, which protect the skin from ultraviolet rays. It keeps body fluids in balance, acting as a barrier against possible water loss. We reveal your mood through our skin, by blushing, going pale, our hair stands on end and we give out a smell (pheromones). The skin acts like a thermostat, adjusting to hot and cold temperatures to regulate body temperature. It transmits sensations of touch, pressure, temperature and pain through nerve receptors and nerve endings. What is the structure of skin? The epidermis consists of flat polystratified keratinised epithelial tissue that covers the entire body surface. 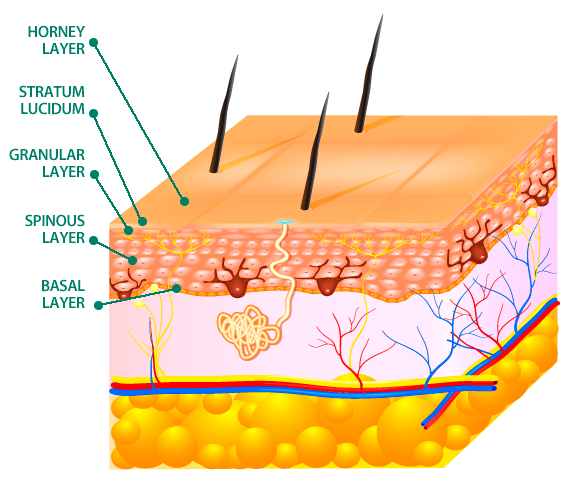 This layer of skin has the largest number of cells and an extraordinarily large rate of renewal. Cells grow from the inside (basal layer) to the outside (horney layers). It varies in thickness (from 0.1 mm to 1 or 2 mm on the palms of the hands and the soles of the feet). Produce keratin, which gives cohesion to the tissue and waterproof the dermis. Synthesise melanin, which is our natural pigment and protects us from ultraviolet radiation. Skin does not depend on their number, but rather on their size. Where the keratinocytes are produced. The keratinocytes are spindle shaped, and start producing keratin fibres. The cells produce keratohyalin granules (the precursor of keratin) and these go into the extracellular matrix. Cells have been flattened to confer a greater degree of structure. This is the outermost layer, which contains many layers of dead cells that offer protection. These cells come loose, through a process called scaling. The sebaceous and sweat glands empty into this layer. This structure supports the skin and gives strength and elasticity. It is mainly made up of fibroelastic connective tissue. It is much thicker than the epidermis. The extracellular matrix contains a high proportion of fibres, loosely compacted, collagen (> 75%), reticulin and elastin. It is vascularised tissue that supports and nourishes the epidermis. It accounts for the largest mass of skin and has a maximum thickness of about 5 mm. Piloerector muscle, hair follicle, sebaceous glands, and sweat glands, and blood and lymphatic vessels. This consists of loose connective tissue which serves as an anchor. When these bridges are lost, the typical wrinkles appear. It is made up of adipose tissue, through which blood vessels and nerves run. The subcutaneous tissue serves as an energy store, as well as providing thermal insulation and mechanical protection.